In 1987, the comic book market was glutted by hundreds of independent comic books, many of them inspired by Megaton and other b&w pioneers like Cerebus, Elfquest and Teenage Mutant Ninja Turtles. To compete in the changing market, a decision was made to expand from the one black & white book to a full line of 4-color comic books, including the title's most popular characters: Vanguard, Ethrian, Megaton and Wildman, along with newcomers Ramm and Youngblood. 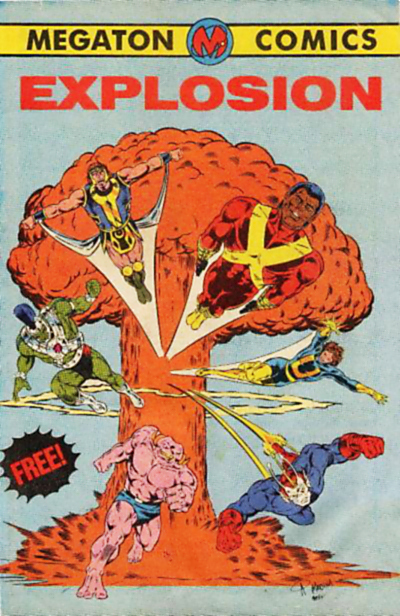 Megaton Explosion was a free sixteen page 4-color promotional comic book, a Who's Who guide to Megaton's characters. Close to 100,000 copies were distributed to comic book stores but it wasn't enough to catch the public's attention. Two issues each of Ramm and Wildman were published before low sales doomed the whole venture and the plug was pulled on the entire line. Just a few years later, a number of the characters such as Vanguard, Youngblood and Savage Dragon resurfaced at a brand new publishing company named Image Comics, co-founded by Megaton alumni Erik Larsen and Rob Liefeld. Copyright 2016 Gary Carlson. Vanguard is copyright 2016 Gary Carlson and Erik Larsen. Ethrian is copyright 2016 Frank Fosco. Wildman and Rubberoy are copyright estate of Richard "Grass" Green 2012. Ramm is copyright 2016 Chris Ecker. Savage Dragon and related characters are trademark and copyright 2016 by Erik Larsen. Youngblood and related characters are trademark and copyright 2016 by Rob Liefeld. Berzerker, Ultragirl and Megaton are copyright 2016 Gary Carlson. Ultiman is copyright 2016 Gary Carlson and Chris Ecker. Ultiman, Crusader and Sparky are copyright 2016 Gary Carlson and Chris Ecker. Dr. Weird is copyright 2016 Gary Carlson and Ed DeGeorge.